Inlet Volunteer Emergency Services | serving the Inlet, NY area of the Adirondack Mountains. Sign up to receive IVES news notices in your email. Hose Company: first Monday of each month at 7:30 p.m.
Ambulance Squad: third Monday of each month at 7:30 p.m.
February & August before Ambulance; May & November before Hose Co. 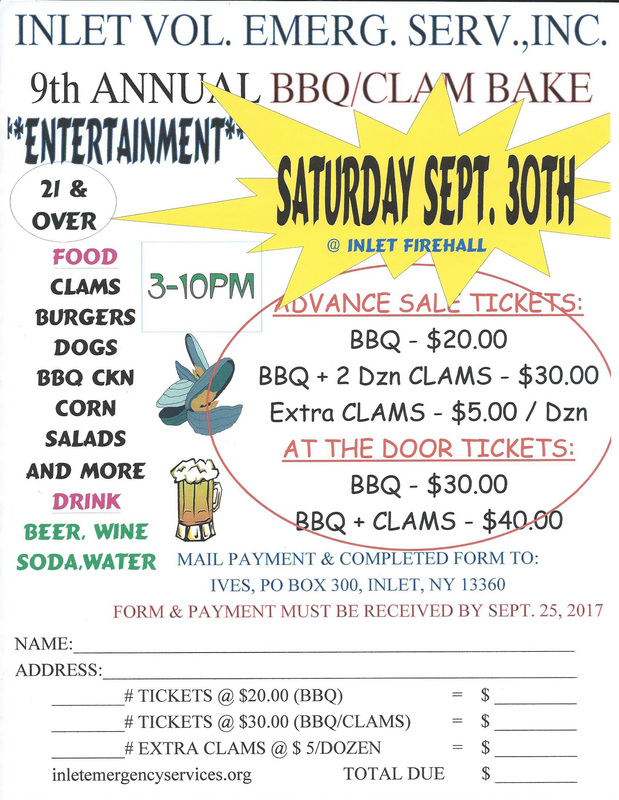 The 9th Annual IVES BBQ-Clam Bake is Saturday September 30, at the IVES station on the corner of Route 28 and Limekiln Road. Purchase your tickets by September 25 and save $10.00! Download the reservation form here. The 8th Annual IVES Clam Bake is Saturday September 10, at the IVES station on the corner of Route 28 and Limekiln Road. Purchase your tickets by September 5 and save $10.00! Download the reservation form here. The 7th Annual IVES Clam Bake is Saturday September 12, at the IVES station on the corner of Route 28 and Limekiln Road. Purchase your tickets by September 4 and save $10.00! Download the reservation form here. The IVES Gary Rudd Memorial Golf Tournament is Sunday August 16th. Sign up today! The 6th Annual IVES Clam Bake is Saturday September 6, at the IVES station on the corner of Route 28 and Limekiln Road. Purchase your tickets by August 28 and save $10.00! Download the reservation form here. The Inlet Volunteer Emergency Services organization is again hosting the Gary Rudd Memorial Tournament on Sunday, August 17th at the Inlet Golf Club. The cost is $85/person. Entry fee includes golf, cart and dinner. The tournament is open to 36 four-person teams. If you don’t have foursome we can add single registrants to round out your team. Registration check-in begins at 7:30a.m. with a shotgun start at 8:30a.m. You can download registration forms here or get at the Inlet Information Office , Inlet and Thendara Golf Courses and at the IVES station on the corner of Route 28 and Limekiln Road. The proceeds from the tournament go to provide emergency services for the Inlet/Eagle Bay area. This includes fire protection and emergency medical care through our two ambulances.